When we decide a Barcelona travel and if we do some check on internet, Antoni Gaudi will be one of the first subjects that you come across. He is the most known and successful artist, architecture and pioneer of Art Nouveau of Spain, Barcelona city. In this article we will try to tell everyting about this unforgettable master Antoni Gaudi with full name Antoni Placid Guillem Gaudi i Cornet who lived in Barcelona city throughout his whole life. 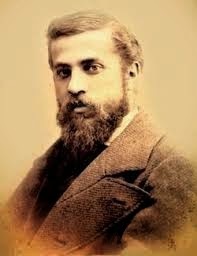 Life of Antoni Gaudi, works of his art, his childhood and his disease which led him to be the greatest at his works.... All about Antoni Gaudi is below with his pictures. So who is Antoni Gaudi? Antoni Gaudi was born on 25th July 1852 in Reus town of Catalunia as a son of craftsman. He is known as Catalan architecture in the world. He later became the pioneer of Barcelona city's most famous architectural works. In the world-wide childhood of many artists, authors or poets is really outstanding when compared to people who are not in literature or art world. Is it because interesting childhood makes them splendid and well known or talented artists? When someone has a different childhood, that means he generally will have unique life. Antoni Gaudi had a tough childhood. He had rheumatic problem and this illness made him miss the school, hang out with his friends. He missed an ordinary childhood. Gaudi generally observed everything around him such as animals, stones, plants or the nature. We will explain the natural symbols in his works below in other title. All these observations reflected in his works later. Antoni Gaudi studied at architecture and it lasted nearly 8 years due to military and other issues but his school years started in the preschool of teacher Francesc Berenguer. There is an anecdote told by his teacher about how Gaudi's unique vision shows itself in his early childhood. His teacher at one of his lectures says that birds have wings to fly and Gaudi says that but chickens in our garden have wings too. They don't use it for fly but to run faster! At the age of eleven he attended to Escola Pia in Reus. Here, Gaudi gained his religious vision and proved how excellent student he was especially in geometry. At this school every Saturday, the Oficio Del Parvo De La Virgen was recited and his perception about the value of the divine history of the salvation of man through Christ incarnate and now in his works anyone can realise these reflections today. 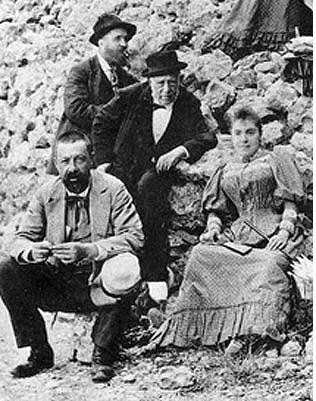 In 1868 Gaudi moved to Barcelona in order to study architecture. After passing some entrance exam, Gaudi could have the chance to study at Upper Technical School of Architecture. Beside studying architecture Gaudi was interested in Philosophy, History, Economics and Aesthetics. He attended these classes at Provincial School and explained that having various architectural styles depend on not only aesthetic ideas but also social and political atmosphere. He improved himself nearly in every discipline. In his youth Gaudi had to work to pay his school expenses. His first projects were for the church of Monastery of MontSerrat. Antoni Gaudi never compromised on quality. He was called 'Dandy'. He bought all his clothes from the first class stores. He had private barber. Only he didn't wear new shoes as he thought old shoes were more comfortable. He used to give his new shoes to his brother to wear for a while and after that he would wear those shoes. Thanks to his innovative and daring ideas, Gaudi could work with many famous people and he had many famous projects. Nearly many old buildings were designed or built by Gaudi such as Park Guell, La Sagrada Familia, Palau Guell, Casa Mila, Casa Battlo, Casa Celvet, etc. We will explain these works in seperate articles in the following days. When you make your Barcelona travel, it's too easy to come across one of the works of Gaudi. Barcelona city is surrrended by his splendid buildings and you can't take your eyes off them. Antoni Gaudi wouldn't like to be popular and in his old age he didn't dress with much care and when he laid on the ground after the accident, nobody recognized him at the first look. On June 7, 1926 he was run over by a tram. It's said that Gaudi was walking back to see his work of art and he didn't realise the tram coming. After his tragic death at the age of 74, the taxi drivers refused to take him to hospital as they couldn't recognize him. 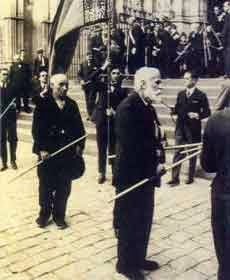 On June 12, 1926 Antoni Gaudi died. Many people in Barcelona dressed in black for his funeral and his body was buried in the crypt of the edifice in which he worked for 43 years in Sagrada Familia.